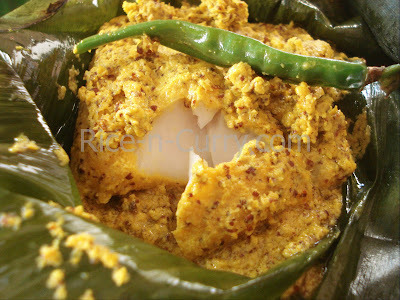 This is a very common fish recipe of Eastern India, which seals in the perfect flavors of fish and sauce immaculately. I recommend using boneless Rahu, Carp, Hilsa, Bhetki, Surmayee, Vasa for making these parcels. You may serve them as starters, with drinks or like a true Bangali, have them with steaming puffy rice! 1. Wash and cut the fish into squares. Rub lemon juice and salt to the fish cubes. 2. Make mustard paste with green chillies and salt. 3. Mix tamarind pulp with jaggery, chilli powder and a pinch of salt. Put over a slow heat, and let the jaggery melt. Remove before the consistency gets thick. 4. Coat one side with the mustard paste; and put it on a banana leaf. 5. Coat the other side with tamarind-jaggery paste. Sprinkle some grated coconut on this side. 6. Fold the sides carefully and secure them with a toothpick.Fold the rest of them. 7. Place all of them on a steamer/ idli-maker/ momo-steamer. Steam for about 10-12 minutes. sounds good..I mean steamed food is always yummy..
wish to visit you soon..may be I can take those classes from you..
Aha...when will that be, Vish!! Come over for lunch...I mean it :-) Thanks...You are special since you opened the account!! You finally did it..! Yeah...!! As for this page, I just love every thing about it. A prefect fire back ground and your first recipe is my absolute fave. Thanks sooo much, Ghaz...Your approval makes me happy and relieved! Wordpress is there, want to use it for poetry etc.